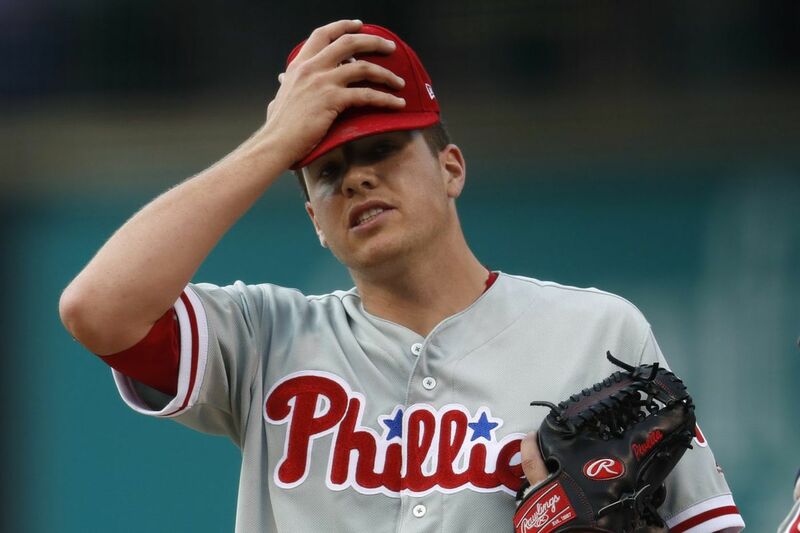 Phillies starting pitcher Nick Pivetta holds his head after giving up a single to Rockies Gerardo Parra to allow in two runs in the first inning of a baseball game on Saturday. DENVER — Pete Mackanin stepped onto Coors Field and raised his right arm before Pat Valaika's foot touched home plate. The manager wanted a new pitcher in the third inning Saturday of an 8-5 Phillies loss. By employing one of the youngest starting rotations in baseball, the Phillies know they are destined for nights like these. They will separate who belongs and who does not. This ballpark is a good barometer. Nick Pivetta threw 29 pitches before he recorded his first out. He did not survive the third inning; Valaika ended the rookie righthander's night with a 407-foot shot to left field. The rest of the game was reduced to pebble hunting. That is when Mark Leiter Jr. entered the game, and all the Phillies wanted to talk about after was the 26-year-old rookie's performance in a mop-up role. "He put on a clinic on how to pitch," Mackanin said. "He threw strikes with all of his secondary pitches, and he has quite a few of them. He made a lot of good hitters look bad tonight. I can't say enough about his performance." "It's never a good feeling when you leave your bullpen out like that," Pivetta said. "But he came in and did a really, really good job. He kept the game as close as he could." Leiter struck out nine of the 15 batters he faced. Those nine strikeouts were the most for a Phillies reliever in 47 years, since Lowell Palmer struck out 10 in 1970. Yes, the game was lopsided when Leiter entered. But this is Coors Field, where weird comebacks are possible. The Rockies feature a dangerous group of hitters. Leiter attacked them. The former 22nd-round pick from the New Jersey Institute of Technology threw 52 pitches and 40 were strikes. The Rockies whiffed at 13 of his pitches. He used six different types of pitches. "It's disappointing to lose," Leiter said. "But everybody has a job to do." Leiter found a rhythm with Jorge Alfaro, the prospect who has caught him at triple-A Lehigh Valley this season. Leiter struck out all-star outfielder Charlie Blackmon twice. Former batting champion D.J. LeMahieu and MVP candidate Nolan Arenado were victims, too. Leiter used his splitter seven times to generate a swinging strike three. He does not throw hard. He relies on deception. He has a sizeable arsenal, and it is rare that all of his pitches are weapons on the same night. But he has a strategy behind it. "In my opinion, they all have a purpose when I use them," Leiter said. "I just tried to really execute whatever pitch I'm going to throw. … If you only use a pitch two times in a game, it still might help you. They haven't seen it." Leiter has a 4.35 ERA in 41 1/3 innings this season while used on an inconsistent basis. "He's had good outings for us in the past," Mackanin said. "Like everyone, he's a rookie. He's getting his feet wet. But he pitched like a 10-year veteran tonight. He put on a clinic for every pitcher in baseball. It was really a lot of fun to watch." Daniel Nava, the 34-year-old outfielder who has resurrected his career, fell a double shy of the cycle. Inserted into the lineup to replace an injured Aaron Altherr, Nava clobbered a three-run homer in the eighth inning. Alfaro started behind the plate and wore his dark blue IronPigs equipment. The 24-year-old catcher singled in his first two at-bats to equal his major-league hit total from his brief audition last September. Alfaro could return to the minors as soon as Monday or Tuesday; Andrew Knapp's bruised right hand felt and looked better Saturday. Knapp said he was regaining grip strength. Pivetta has a 5.89 ERA in his first 16 major-league starts, which have totaled 84 innings. The first three Rockies reached on a walk, a hit batter, and a single. They all scored. Tommy Joseph committed a ruinous error. Pivetta threw 42 pitches in the first inning. "Because of his potential, we have to let him pitch," Mackanin said. "He has a good arm. He has good stuff." Leiter's 4 1/3 impressive innings were his way of showing he belongs here. Pivetta, a more touted pitcher, has work to do.